Should have had this posted in time for Valentines Day but the project, movie, and samples were not complete in time. So... Pin this one for next year, it's a peach of a lesson! 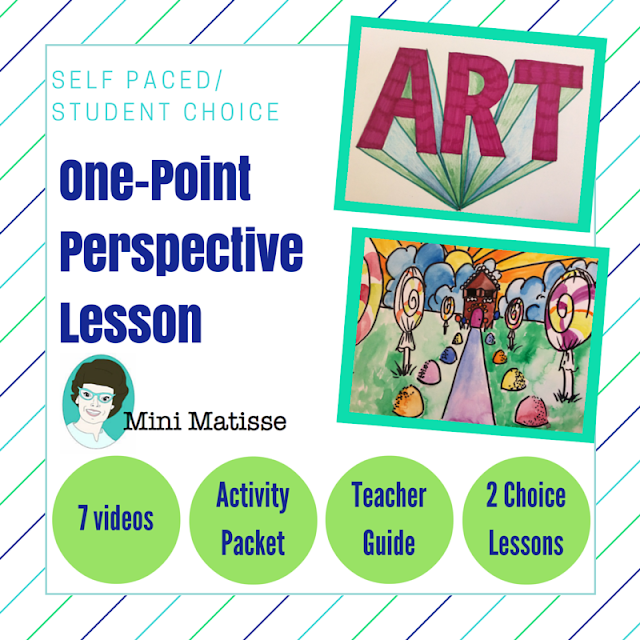 The video below was intended for two, 1-hour art sessions. 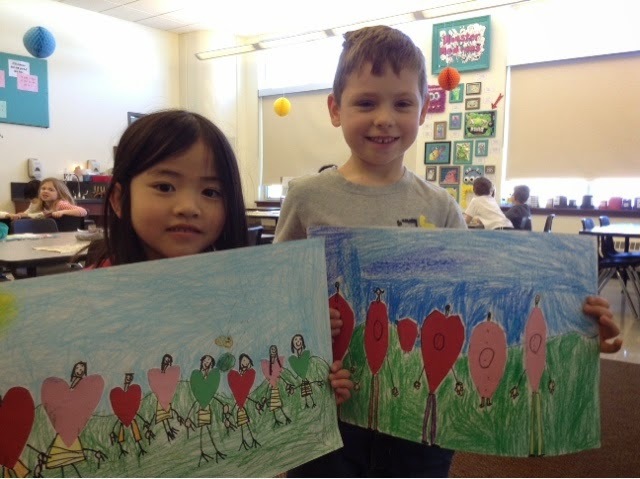 I should also mention I did the heART stations first so these students had practiced making a heart. I had done this lesson last in 2011 with my Rogers Elementary Students. It became a repeat because of how successful, and just darn sweet it is. Parents treasure this one. 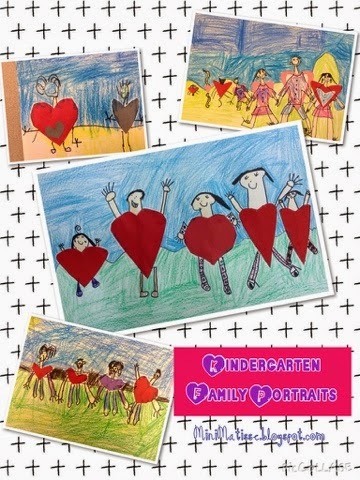 The intent was to ask students to create their family using hearts as the body. The word family can be confusing to students. We cover the different looks of a family (ex. 1 dad, 2 moms, grandparents, pets... so on). Sometimes if it get's too hard, I suggest to create only the people living in one house. They can make a second one (if time allows) for a second household. It's always fun to see how different artist approach this lesson. Here are two examples... 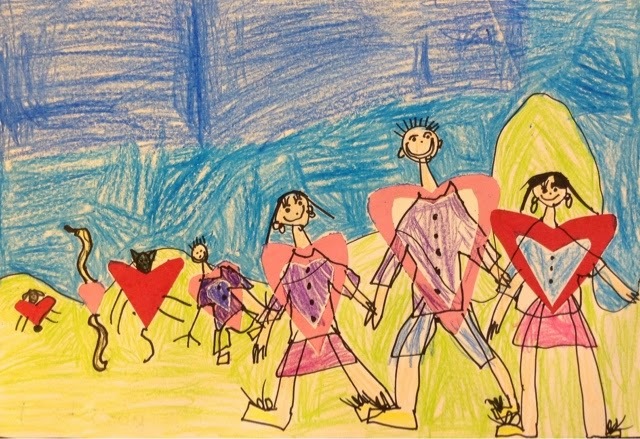 Above you see that the idea of a heart for a body was a little too abstract for this artist. 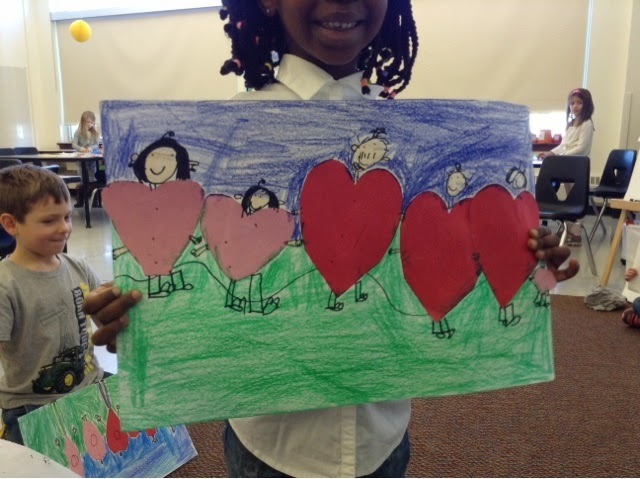 She had to make a separate outfit on top of the heart. I also like the fact that she has a dog, cat, and heart snake in the image. Below the artist thought about day and night and represented them both in their artwork. I love the scribble in the sun. Warning... This one is going to make you say Awe out loud. 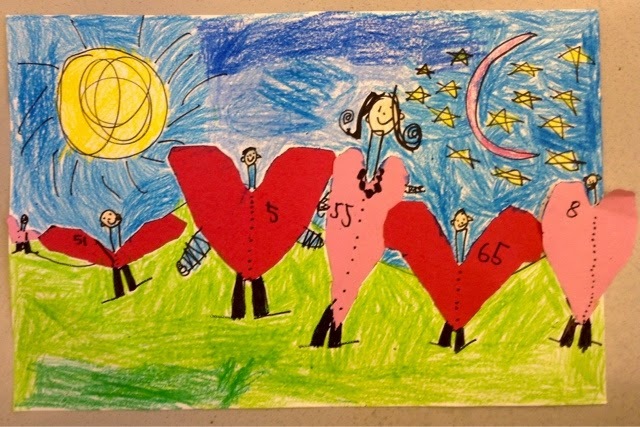 This young artist create a image with his Dad, his brother, and himself. His mom was the only heart that was red (all the boys were gray). 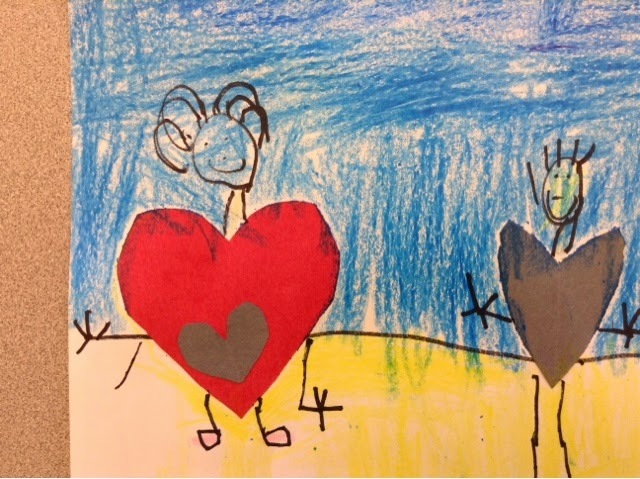 As you can see, this young artist represent his soon-to-be baby brother within his mom's red heart. See... I told you that you would say Awwwweee. It's fun to see the variety of families. When we have time in class we talk about that and how families look different for a second time after completion. This happens every time I do a self- project/portrait. I have images of a multicultural variety, I speak to the point that there are different skin tones. But in this primarily caucasian school, I always get students who do not represent tone of skin correctly. As an art teacher I don't care if they create their grass green, or yellow... The sky doesn't have to be blue in my classroom. But when I see misinterpretation of skin color, I feel I have failed. Please help with suggestions, stories, or comment. These are sooo sweet and adorable! I can't wait to try this next Valentine's. I hear you about the skin colour issue- the way I tackle it (my school is very multicultural with many first generation immigrant children) is to make a BIG deal of my collection of 'multicultural' colored pencils and crayons. (Crayola makes some, LYRA is my favourite brand, though). I also find my African students tend to take the 'peach color' skin color and it makes me so sad. (some also give themselves blonde hair :( So I set up a 'testing station" where the kids have scrap paper and the multicultural crayons (which I keep separate from my regular crayons). They have to test out the colour on scrap paper then hold it up to their skin- it needs to match (more or less). They really buy into this and often come running up to me asking "Do you think this color matches?" I make a big deal of it having to match in order to be realistic. Of course we have the class talk about how we all look different and that's ok, what makes us special, etc. etc. Oh... Miss, That is a great suggestion. I'm going to do this ASAP!! Thank you so much for your suggestion.